The indomitable Slonský returns! Perfect for fans of Ian Rankin, Jo Nesbo and Peter Robinson. Josef Slonský is preparing to take up his promotion as Captain when a spanner is thrown in the works. He has to pass a medical, and a lifetime’s supply of beer and sausage is not helping his chances of passing. Faced with a strict diet and exercise regime, Slonský is even less amenable than usual. But, his attention is caught when reports come in of a Second World War bomb detonating in a nearby field. It seems four metal detectorists were killed in the blast upon discovering it. Could this be a murder investigation? Was the bomb planted? FIELD OF DEATH is the fourth international crime thriller in the detective series featuring Lieutenant Josef Slonský: an atmospheric police procedural full of dark humour. No, Josef Slonský is a man on a mission. He must pass a medical in order to take up his promotion as Captain in the Prague police force, and a strict diet and exercise regime is making him just a little more grumpy than usual. But then an explosion in a field captures his attention. It’s reported that four men with metal detectors managed to discover and then to detonate a World War II bomb. But Novák the pathologist has some doubts about this explanation, and Slonský starts investigating. Was it an accident, or is it murder? This is the fourth brilliant entry into the Josef Slonský series, and I think it is the best yet. It has a delightfully eccentric plot (no spoilers here) and includes his two offsiders Jan Navrátil and Kristýna Peiperová. Peiperová is about to undertake a one-year assignment for the Director of Criminal Police, and Slonský is plotting to make sure that she returns to his division afterwards. And Navrátil ends up with his own critical assignment as Slonský works to solve the case. There’s plenty of action towards the end, and more than a few twists. As I’ve come to expect, Slonský finds some unusual albeit pragmatic solutions to problems and it’s an entertaining read. While this novel could be read as a standalone, I’d recommend reading the novels in order because the character development (and related backstory) is as important as the case being solved. And now I will wait patiently for another instalment. Highly recommended. Note: My thanks to NetGalley and Sapere Books for providing me with a free electronic copy of this book for review purposes. 5.0 out of 5 starsAddictive and entertaining Czech-flavoured crime fiction. 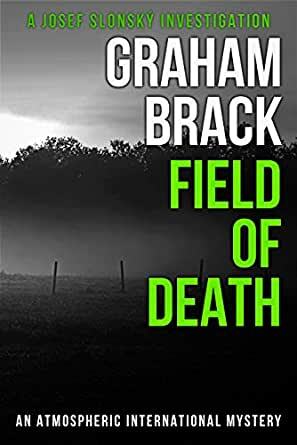 Field of Death is the fourth book in the Josef Slonský Investigations series by British author, Graham Brack. Slonský hears about the explosion of an old World War Two bomb that kills four men with metal detectors, and assumes he won’t need to get involved. But when pathologist Dr Novak is on the scene in a field near the little town of Holice, he summons Slonský: both he and his blast injuries expert believe this is murder. And a brutal one at that. One of the victims is Sedlák, a local police lieutenant, yet his colleagues don’t seem to be doing much to solve the case. And when Slonský and Peiperová inspect the scene, they see unusual heavy vehicle tracks in the vicinity. A military expert shares the (apocryphal?) story of the Ghost Battery: Slonský and Lukas worry about who might have access to this military hardware if it is indeed true. Given the ruthless nature of the crimes, Navrátil is none too pleased to be going undercover. Holice needs replacement staff so Slonský (rather sneakily) sends their own Lieutenant Doležal to stand in for the victim; Doležal, struck by the strange attitude at the police station, is leery of trusting any of them and reports back to Slonský his suspicions about a huge shopping mall development. The Fraud Squad’s Major Klinger gets interested: are the Russians involved? Perhaps the cases are unconnected, but Slonský’s contact in the Security Information Service doesn’t believe in coincidence. There may have been readers worried about Slonský’s diet in the first three books; are they now cheering him on as he tries to comply with dietary recommendations, even as they feel a little sorry for him? Surely he won’t keep this torture up once the necessary hurdles have been vaulted! After all, what (or who) could possible induce him to persist with a strict regime of healthy food and exercise? Brack brings his extensive therapeutic knowledge into play when Slonský accepts some pharmaceutical help with weight loss, but this scene is best not read with a full bladder if readers have continence issues. And, of course, there are plenty more laugh-out-loud moments in the slightly Keystone-cops-esque ride to the climax. The case, of course, is intriguing and Slonský’s team excels in their detective work, their initiative, and their dedication. The cassock, in particular, was an excellent idea. With the ever-changing dynamics of the work situation for Prague’s finest police, it will be interesting to see what (now Captain!) Slonský and his colleagues are faced with next. Addictive and entertaining Czech-flavoured crime fiction. This unbiased review is from an uncorrected proof copy provided by NetGalley and Sapere Books. A grenade from World War II explodes in a field in the Czech Republic and kills four people. Lieutenant Josef Slonský thinks something is suspicious about this does a little digging. It looks like this incident could be just a small part of a bigger plan. Slonský then enlists the help of the officers he is mentoring, Jan Navrátil and Kristýna Peiperová, to investigate this strange case before there are any additional victims. 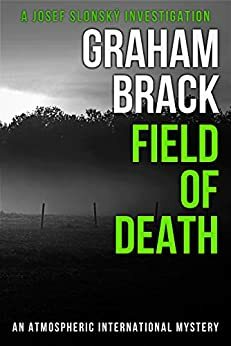 "Field of Death" is the fourth book in this excellent series. The books have strong procedural elements, but are elevated by the unique Prague setting and wonderful humor from beginning to end. Slonský may sometimes find ways of getting out of doing work, but he is dedicated to his job and loyal to his country. I love his determination to solve cases, which means frequently delegating to officers Navrátil and Peiperová. This case takes some unexpected and dangerous turns, but Slonský and his team are determined to get to the truth. I was worried when Navrátil was given a special assignment that the usual camaraderie wouldn't be there, but this plot element turned out to be very entertaining. The book has a lot of action in the final chapters, some of it pretty intense. Slonský, Navrátil, and Peiperová have made a great team so far, but changes are coming. Peiperová is preparing for a one-year assignment assisting the Director of Criminal Police and Slonský surprised even himself with his ambition and is about to become the new Captain of their division. I can't wait to see how those developments play out in the next installment. I have read and enjoyed all of the prior books in the series, but the book is also accessible to new readers. Fans of Peter Robinson or Colin Dexter will enjoy this book and the entire series. I received "Field of Death" through the courtesy of Sapere Books. The book was provided to me in exchange for an honest review.